The unusual green gemstone featured in this necklace is called prasiolite, combining the Greek for prason ("leek") and lithos ("stone"). Prasiolite jewelry components are most often heat-treated amethyst, which is why you sometimes see the stone called "green amethyst", though the Federal Trade Commission has since declared such naming conventions as misleading to the consumer (amethyst by definition is a purple colored quartz; to call something "green amethyst" is a contradiction in terms). Whatever the name, it's a beautiful gemstone with great shine and icy fresh color. 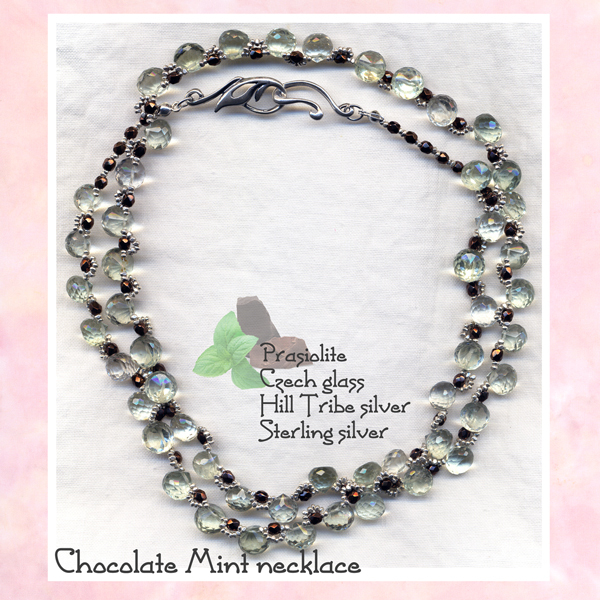 Pairing these with chocolate brown Czech fire-polished glass beads reminded me of delicious wafer thin mints often served after dinner. Hill Tribe silver originates from the Thai Karen Hill Tribes and contains higher percentages of pure silver (95%-99%) than sterling silver, which means it tends to be softer and tarnish more quickly. 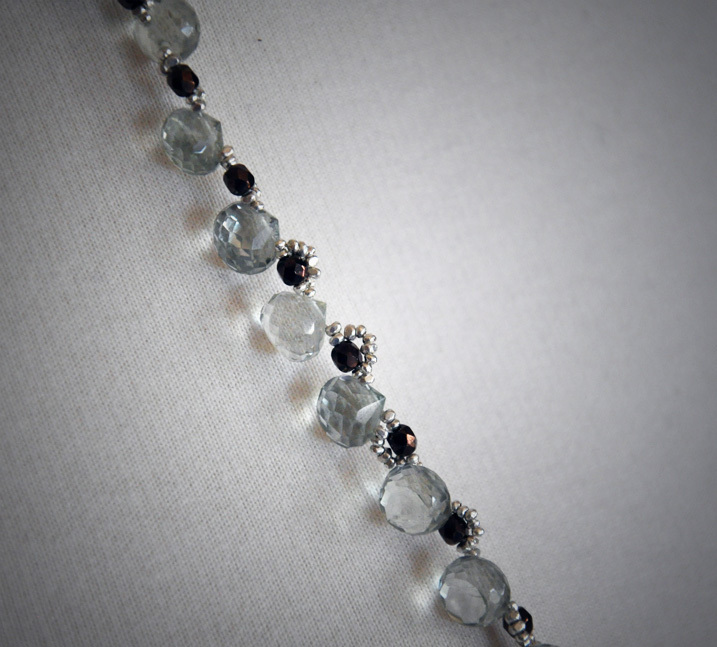 The small nuggets used to encircle the glass beads add an intricate, vintage feel to the design. 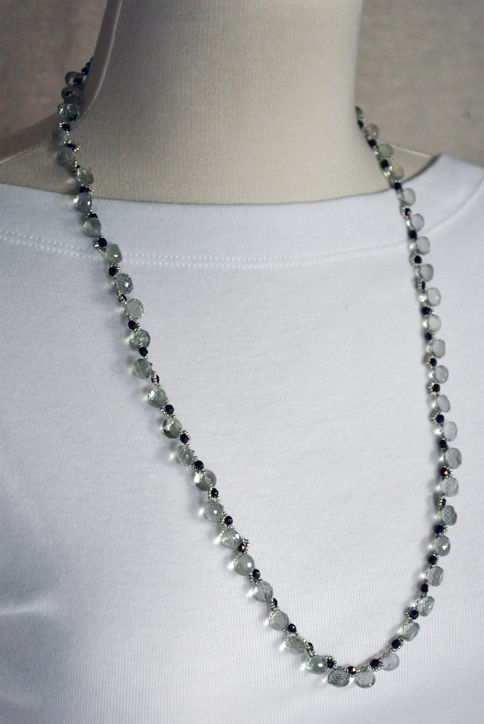 The high quality (95%-99% silver) of the Hill Triber silver beads makes them softer than sterling silver beads. They can sustain normal wear and tear but not repeated or prolonged tugging from a determined toddler! As with all beaded jewelry: do not let young toddlers chew on it. This 26" necklace can be worn with a variety of necklines, from casual tops for everyday to blouses and collared shirts for office wear to shift dresses for the evening. 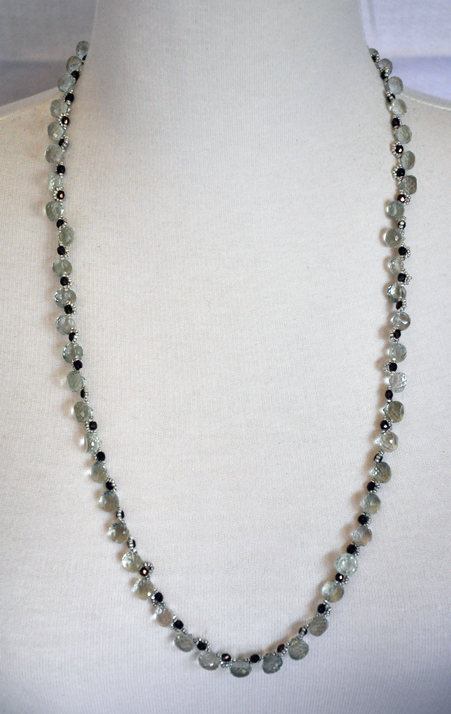 It is a lightweight necklace with great design details.